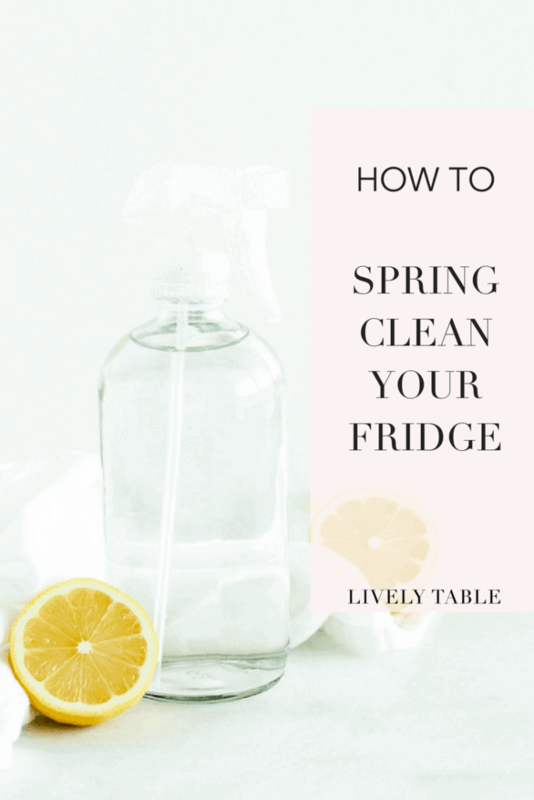 Feel refreshed and organized in the kitchen this spring with these tips on how to spring clean your refrigerator! Anyone who knows me well knows that I LOVE organizing and getting rid of things. I always have a donation pile going in my house, I love going through my clothes each season, and I like to have an organized kitchen and closets. Being organized makes me feel so much better mentally. While it’s something that you should try to do more than once a year, spring is a great time to clean out your refrigerator. How long has that jar of mayo been in there? What is that brown liquid collecting in the bottom of the veggie drawer? Not only is having a clean refrigerator safer, but it will also help you to know exactly what you have on stock so that you can reduce food waste. No more doubling (or tripling) up on condiments, and no more leftovers getting pushed all the way to the back, never to be seen again. It’s time to spring clean your refrigerator so you can start the season fresh! How many miscellaneous jars of sauces, dressings, jams, and random condiments are floating around in the doors and back or your refrigerator? Check the dates on all of your condiments. Toss anything that’s expired, and of course, anything that looks moldy or bad. Use anything remaining as inspiration for future meals and snacks so you can use it up before it does go bad. This one kind of goes without saying, but any old leftovers, expired yogurt, or moldy items need to get thrown out. You may choose to take on your spring cleaning before a big grocery run. Take everything out of your produce drawers and any other drawers you have in your fridge. Remove the drawers and wash them with warm soapy water. Then dry them well and place food back in them. Make sure crispers are set to the right setting. Wipe down any shelves and surfaces that can’t be removed with a disinfecting spray or cloth. You can use a natural commercial disinfectant, a homemade one, such as one made with equal parts vinegar and water, or a traditional one. Just make sure to get any visible grime on shelves, door caddies, and the sides and bottom of your fridge. Don’t forget the handles! Try to have some sort of organized system when you put all of your food back in the fridge. Place produce and cheese in the proper drawers, have specific shelves for things like eggs, condiments, and drinks, and try to keep it organized as you go throughout the week. If you have trouble, buying some clear bins for specific items can help. While you are at it, now is also a great time to clean out and take inventory of your freezer, too. Ahhh. Now don’t you feel better? I certainly do!